Niché dans la station balnéaire de la péninsule, la zone la plus prestigieuse de Marina del Rey, entre la Via Marina, le canal et l'avenue Pacific. Cette enclave haut de gamme dispose plusieurs millions de foyers dollar, la sécurité privée, 24/7 belles rues de marche paysagers, beaucoup de parking. Étapes de la plage, la distance pour célèbre plage de Venise et ses canaux, près de Santa Monica, Malibu et un court trajet en voiture à Beverly Hills à pied, seulement environ 3 miles de l'aéroport international de LAX. À proximité de nombreux excellents restaurants, du Michelin aux excellents repas maison, aux boutiques branchées Abbot Kinney, au célèbre Gold's Gym. Agencé par un décorateur Unité. Télévision à écran plat. The apartment was clean and very efficient with a good parking situation and easy access to the west side and beach communities. Being able to have my dog and plenty of great dog walking places was a huge plus. A quick walk to the beach for a week of amazing sunsets was great after a busy day. The place had everything for my week stay. My only Negative was that the apt is a bit dark without direct sunlight. 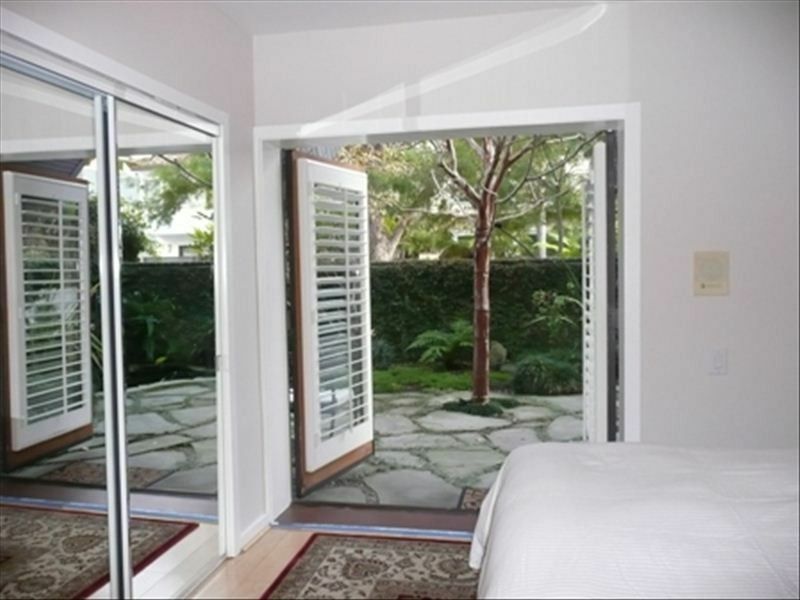 Altho there is a nice small garden out side the bedrooms french doors. I would be happy to stay there again. The very small apartment was clean and cutely furnished. For a small space it was well set up. There was no dishwasher. We have the impression it would be much closer to the ocean than it was. We left after three nights even though we had paid for seven. It just wasn’t for us. It was a personal thing with no real objection to anything about our accommodations. There is a dish washer and we are a 5 minute walk to the sand. I truly am sorry that the guests were not satisfied. My 80 plus 5 star reviews speak for themselves. My intention is give my guests a wonderful experience and have them return. The property is quaint and nice. Short walk to the beach. Had a really nice relaxing time. Thank you, Mark, for being a wonderful host. We were in town to visit family and friends, and the location was perfect (and very close to LAX). We enjoyed our walks along the Canal and the many amenities you had to offer. We look forward to coming back again. since we stayed here on other occasions. Mark was an excellent host and since I am a retired electrical engineer I was able to ascertain how to use HULU for TV viewing. Only recommendation would be to have a more detailed explanation on using HULU for the TV. Découvrez Marina del Rey - le point de départ idéal pour votre séjour Los Angeles, avec de belles vues sur le front et une attitude insouciante. Et il est à quelques minutes de LAX et toute l'excitation de Los Angeles, Venice Beach et Santa Monica.